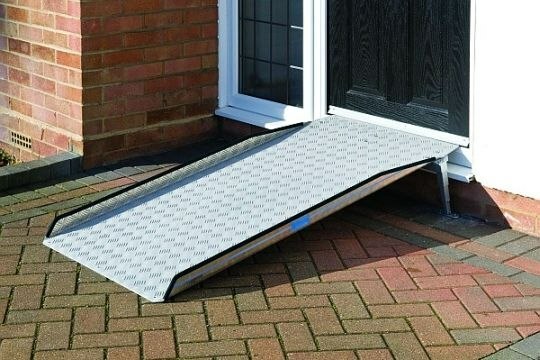 Maximum slope for portable wheelchair ramps in the UK? As a general rule when using portable wheelchair ramps most ramp manufacturers recommend a maximum slope no steeper than 1:12 for independent use and 1:8 for assisted use over shorter distances. Maximum slope for permanent wheelchair ramps in the UK? We updated our wheelchair ramps sites the other day to provide information about wheelchair ramp gradients and how steep wheelchair ramps should be. The CAE (Centre for Accessible Environments) say the maximum gradient for wheelchair ramps is 1:12, with the occasional exception in the case of short, steeper ramps when refitting existing buildings. The gradient also depends on the going of the flight with longer goings requiring shallower gradients. As a general rule most ramp manufacturers recommend a gradient no steeper than 1:12 for independent use and 1:10 for assisted use. i.e. if working on a 1:12 ratio multiply the height of step by 12 to give you the minimum length of ramp.